Species Profile: The Caribbean Reef Shark - We Love Sharks! Species Profile: The Caribbean Reef Shark - We Love Sharks! The Caribbean Reef Shark is one of the largest apex predator in its ecosystem. 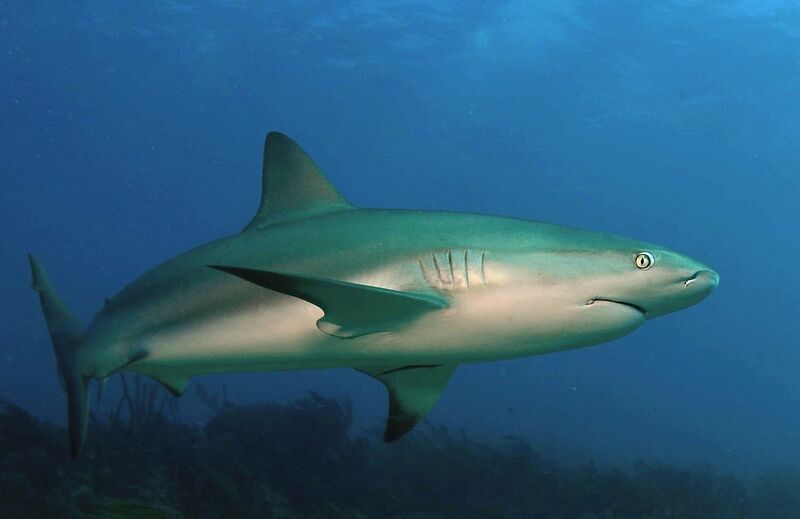 The Caribbean Reef Shark is another of the requiem sharks (migratory, live-bearing, and warm water dwelling sharks) in the family Carcharhinidae. It’s actually the most common reef shark in the tropical waters of the Caribbean Sea. Like many other requiem sharks, it has a robust, streamlined body. Consequently, this makes it difficult to distinguish from other large members of its family. In fact, people commonly mistake it for similar sharks like the dusky shark, and silky shark. This species is also one of the largest apex predators dwelling in the reef ecosystem. They have a dark gray/gray-brown colored body with a white or white-yellow underbelly. Their snouts are relatively short, broad, and rounded. Their eyes are large and round with nictitating membranes (a type of protective third eyelid). Dr. Eugenie Clark, among other researchers, studied this shark in detail. They noticed its habit of resting motionless on the sea bottom or underwater caves. This is actually very unusual behavior for an active-swimming shark. However, Dr. Clark proposed that the strong water current in these caves may help the shark dislodge parasites clinging to its body. The Caribbean Reef shark is of economic value to commercial fisheries and they target it for its meat, leather, liver oil, and for use in fishmeal. However, of late its becoming more valuable alive than dead. This is due to its important place in ecotourism. Despite that, this shark is implicated in a number of attacks on humans with these incidents happening mainly in spring and summer. Though many attribute that to the habit locals and ecotourism businesses in the area have of feeding it bait to approach groups of divers. No doubt, this remains a controversial subject to date. The IUCN classifies the Caribbean Reef Shark as a Near Threatened species. Only about 0.6 meters (2 feet) long at birth, this species has an average adult length of between 2 and 2.5 meters (6 and 8 feet). The maximum length on record is that of a male, who measured 3 meters (9.8 feet) long. Though the heaviest recorded weight of a Caribbean Reef Shark was 70 kg (154 lbs), most reef sharks typically range from 16.7 to 34 kg (30 to 75 lbs) at maturity. The Caribbean Reef Shark is certainly not rated among the world’s family of fast sharks. In addition, it’s somewhat a marine biology celebrity for its sleepy resting sessions. Nonetheless, when threatened or feeding, it’s said to move with “lightning fast” speed. Normally, the Caribbean Reef Shark is uninterested in humans. Therefore, thousands of divers have safely mingled with them in popular tropical destinations for generations. Researchers at the University of Florida have recorded only four documented cases of unprovoked attacks on humans, which were not fatal. 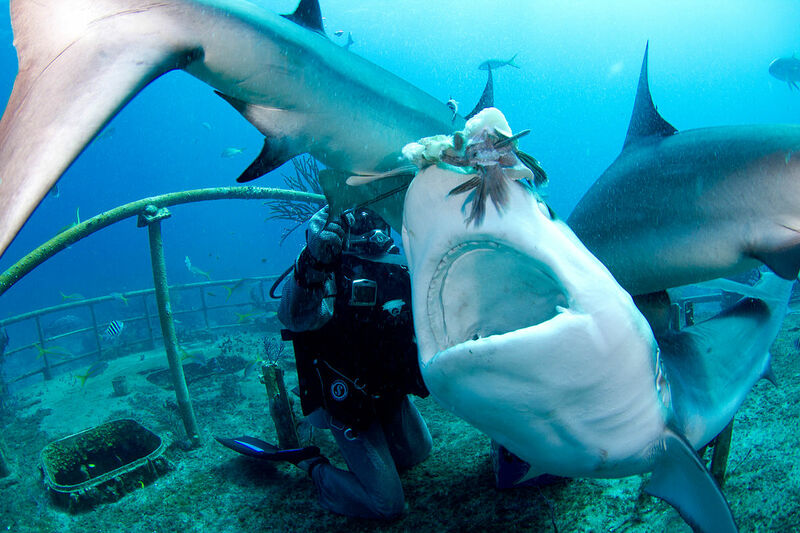 But one major highlight with this shark is the popular “shark feeding” events for tourists in the tropics. In fact, in many parts of the Caribbean, this species is the primary target for these activities. Banned in the United States, the practice remains popular throughout the majority of the Caribbean Reef Shark’s territory. Regardless of the circumstances, the size and weight of this species and its tendency to become aggressive near food, provide for at least the possibility of physical danger to humans. Another potential danger to humans is the likely presence of the toxin methylmercury in its meat. The higher a marine animal is on the food chain of its ecosystem, the more likely it is that the animal will possess elevated levels of any dangerous chemicals found in the prey of that system. Since this species is one of the top predators of the coral reef habitat, there is a risk of excessive levels of this form of mercury in its body and other by-products eaten or used by humans. That aside, this shark is fished commercially for human consumption and its fins, oil, skin, and jaws are also popular commodities. “Shark feeding” remains a controversial subject with many arguing for and against the practice. The Caribbean Reef Shark reproduces by viviparity. The embryos, usually 4 to 6 of them, form inside the female, followed by a live birth. Gestation lasts a full year and depending on the geographic location of the mother, pups can be born at different times of the year. For instance, some are born from February through April (in certain specific waters off Brazil), or in November and December (in other Southern Hemisphere habitats). Physical evidence found on females indicates that mating can be somewhat violent with the males biting them viciously. Female sharks of this species give birth every other year. The Caribbean Reef Shark feeds on a wide variety of bony fish native to the coral reef ecosystem, such as grouper, marlin, and sometimes the gigantic ocean sunfish. They also hunt cephalopods like the Caribbean Reef octopus, as well as stingrays. Juveniles eat a variety of smaller fish, shrimp species, and even crabs. It is believed that the Caribbean Reef Shark is hard-wired by nature to notice the low-frequency sounds produced by struggling prey, and this agile hunter wastes no time in taking advantage of a good opportunity for some fast food. In addition to this built-in hunting tool, the species has been observed using clear “psychological” strategy when hunting. There are instances where observers witness the shark “playing coy” to draw prey closer before suddenly attacking with immense speed and precision. Juvenile Caribbean reef sharks are preyed upon by some of the larger shark species like the tiger shark, and the bull shark. Sadly, the population of the Caribbean Reef shark is declining, and the species is currently listed as “Near Threatened” by the IUCN. Oppressive over-fishing in the primary habitat of the species is a significant cause for concern. Although it’s apparent that the destruction of coral reefs in the subtropics is the leading cause of its decline. There is some protection in selected areas in some nations like the United States and the Bahamas. The Caribbean Reef Shark is believed to have first been discovered in the late 1800s, and surprisingly little is known about its ancestral origins. For instance, there is still some disparity regarding its closest relatives. While Jack Garrick first placed it close to the bignose shark, and the sandbar shark, Leonard Compagno placed it closer to the grey reef shark. Again, another scientist named Gavin Naylor placed it closer to the Galapagos shark, the dusky shark, oceanic whitetip shark, and the blue shark. More study is required to fully resolve its relationship with these other sharks. The Caribbean Reef Shark is common in the tropical and subtropical coral reefs of the Western Atlantic Ocean. Specifically from Florida to Brazil, and it still remains the most commonly seen reef shark in Caribbean waters. Though there are a few sightings as far north as North Carolina, it rarely appears north of the Florida Keys. Therefore, it is primarily prevalent in waters south of the Keys. It’s most at home in shallow waters and at locations near the drop-offs surrounding coral reefs.